Just when you thought the whole Rocky franchise was over, a new character arises to lead another series of movies. Written and directed by Ryan Coogler and co-written by Aaron Covington the story follows the illegitimate progeny of Apollo Creed who died in the ring with Rocky Balboa. This is another energized boxing movie that doesn't hold any punches. The music swells at the appropriate moments and the fight scenes will keep you at the edge of your seat. The recent boxing movie Southpaw covered the dangers of concussion syndrome from taking one punch too many to the head. None of those realities are even mentioned in this movie to distract from the overall theme of an angry young man coming to terms and acceptance of his legacy. Michael B. Jordan plays Adonis Johnson Creed who grew up in foster homes and taught himself to fight. He's taken in my Apollo's wife Mary Anne (Phylicia Rashad) and brought up with privilege and good education. Despite his financial office job, he still goes to Mexico to box, until one day, he decides to follow his dream. He goes to Philadelphia and looks up Rocky (still alive Sly Stallone) at his restaurant, claiming he kind of “owes” him. Rocky doesn't want to train the young man, but Donny Johnson as the name he goes by, wants to prove himself without the expectation of being Apollo's kid. Rocky gives him advice on training and sends him to another gym to get help. But Donny is, if nothing else, hard headed and persistent. He keeps up until eventually Rocky relents and trains him. This doesn't sit well with the father of another fighter who wanted to get Rocky to train his kid. Why would he come out of retirement for some no body out of LA, who they have nicked named “Hollywood”? Of course that info of his identity comes out after Hollywood wins a fight. The pressure is on him to represent his father in the ring. The championship fighter in England Pretty Ricky Colan (Tony Bellew) has gotten into a scandal. His manager thinks by fighting Creed will give him some good publicity although Creed only has one major fight, not counting the ones in Mexico, under his belt. Cue the music as Creed begins to train in earnest. Despite the advice of Rocky, Creed still has lots of anger issues. His love interest Bianca (Tessa Thompson), a singer who is going deaf, inspires Creed to never look back and to do what he loves. Michael B. Jordon who did so wonderfully in Fruitville Station is very buff and angsty as Creed/Johnson/Hollywood. 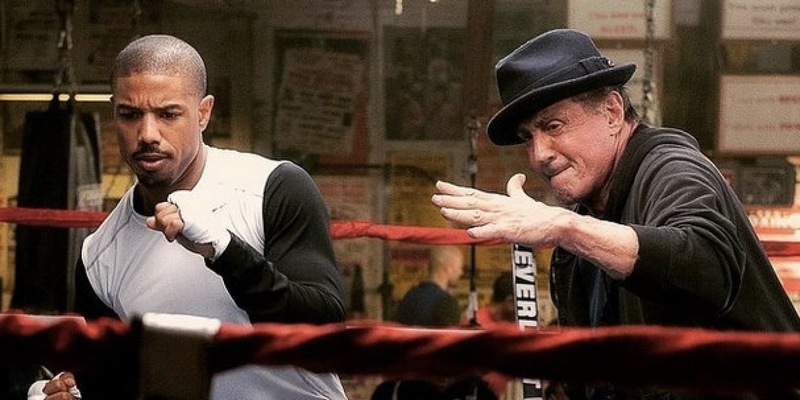 Stallone can still hit the punching bag in rhythm and does a good Mr. Miyagi/Yoda trainer and life coach. The relationship between the two is credible and sometimes endearing when he calls Rocky “unc”. The photography puts you right in the ring with it's POV fighting. The action is way over the top than those Friday Night boxing TV shows, with some brutal sparring. This is a good Thanksgiving holiday movie that you can take the family for some old fashioned feel good manipulative movie magic.